Fall is in the air, and so are pumpkins. 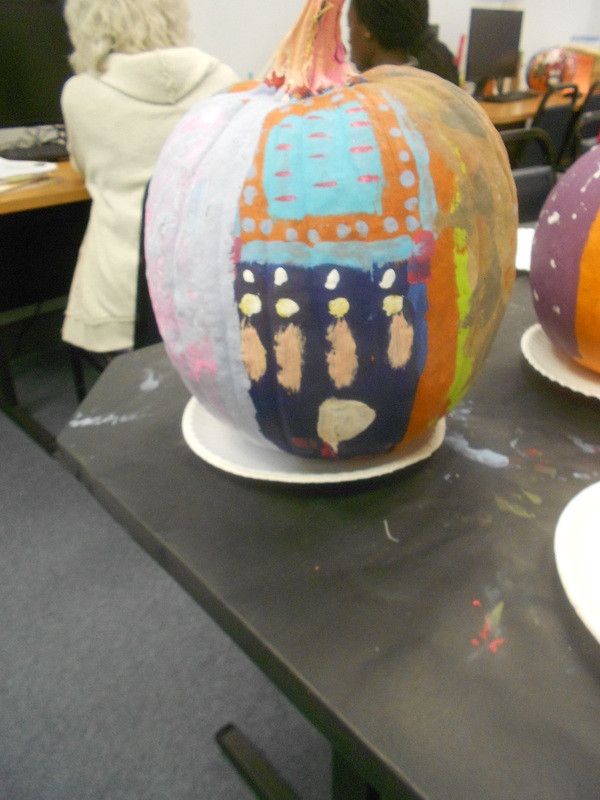 Below are pictures of pumpkins painted by two students I tutor at the Village Library, part of Mission Central, which serves Hurst, Euless, and Bedford. The first was painted by Daniela, a teenager who celebrated her birthday the day I took the picture. The second was painted by another girl, who writes very well, but has to work at math. After lifting hers, I discovered how heavy it was and volunteered to carry it to her mother’s car. 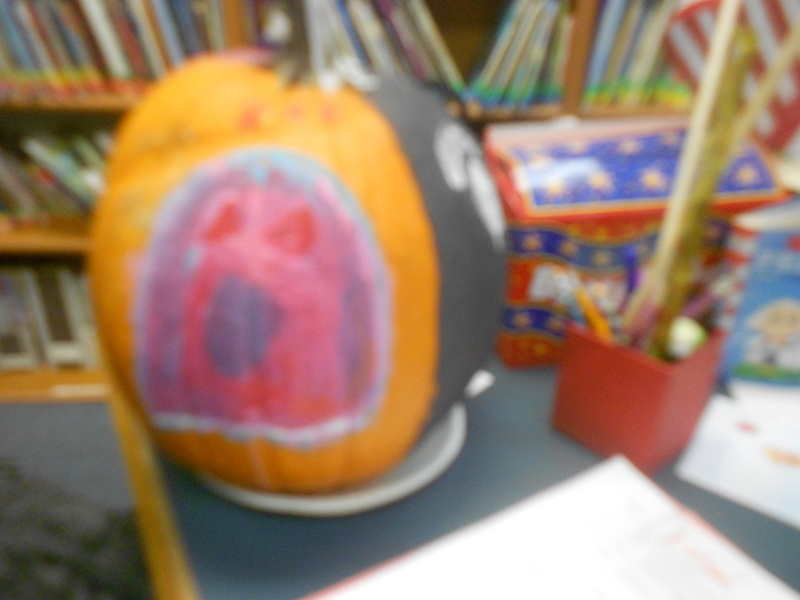 A boy asked how to make pumpkin pie from the pumpkin he painted. I told him you had to cut off the outer skin, scrape out the seeds and stringy stuff, then cut the pumpkin into pieces and boil them. Then you have to mash it before you can make pie with it. I did it once and decided I prefer to use canned pumpkin. Today I dressed warmly as there was a nip in the air. From nine to eleven I handed out food to people from Hurst, Euless, and Bedford. 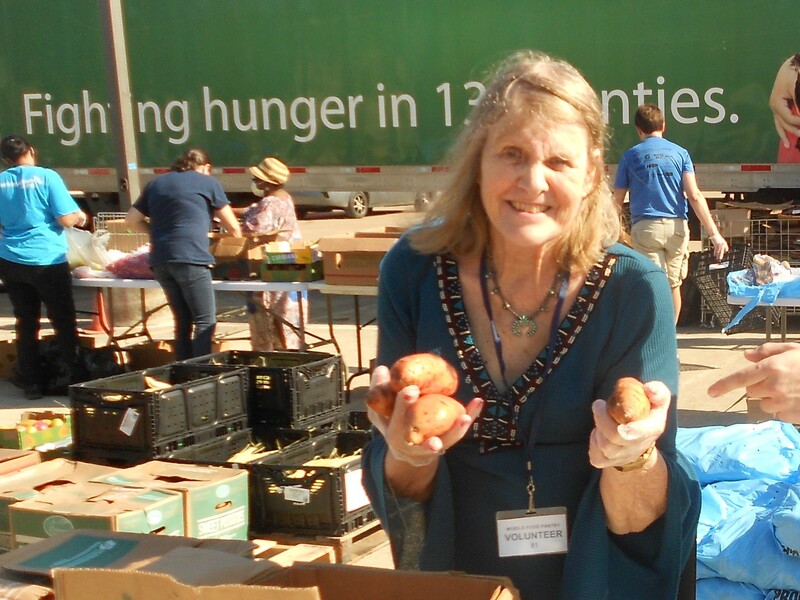 We didn’t have many volunteers, so I was handing out huge cabbages, cantaloupes or honeydew melons, spaghetti squash (a foot long and six inches thick), carrots, and bags of potatoes. I tried to bag the carrots, but couldn’t always keep up. Luckily, I had a helper part of the time. The carrots were big too. Some were over a foot long, and others had divided into two or more lower protrusions. I’m sure they would be tricky to peel, but taste good in soup. Below is a picture of me on a warmer day handing out potatoes. A few days ago, I had business at the Hurst police station. Walking out, I saw a little something flopping around on the floor. 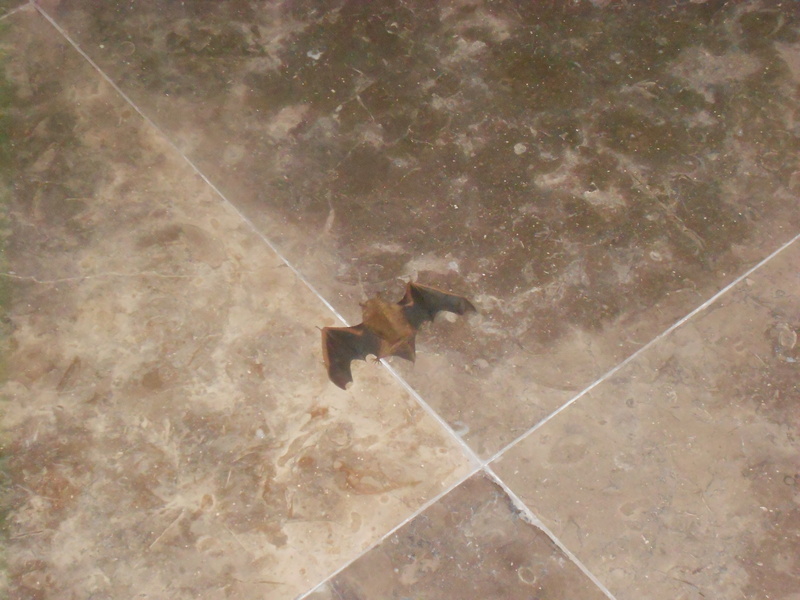 Imagine my surprise when I looked closer and discovered a baby bat trying to fly. This entry was posted in home and tagged November in North Texas, Pumpkins and squash. Bookmark the permalink.